Thanks to the integration of Dynasoft TeleFactura with two different Radius / AAA server platforms, we are able to provide the ideal ISP Radius billing software system. Our Radius AAA add-on extensively broadens the functionality offered by Radius Manager and TekRadius as it adds the ability to bill and bundle any voice and recurrent service with the plans already handled by these server platforms. It also is able to control and manage user access to resources based on financial data such as credit limits defined or voice and data plan allowances thereby increasing your business’s financial and fraud control. TekRadius works with many commercial products such as Mikrotik routers and access points and is able to handle up to 200 connection attempts a second. More connections can be obtained by creating a cluster of servers. 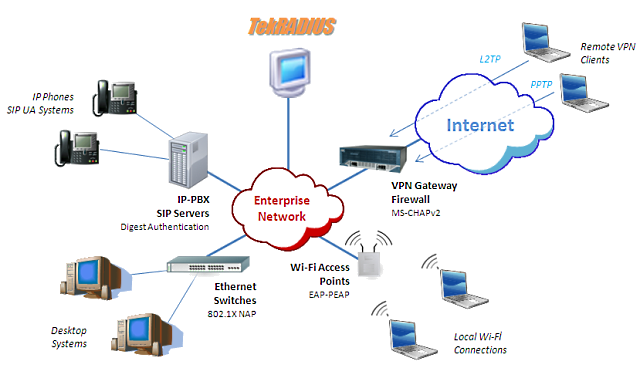 Click here for a picture of how TekRadius integrates with your network. TeleFactura would sit alongside TekRadius (or Radius Manager). TekRadius also make other utilities such as TekCERT, TekIVR and TekSIP. TekSIP is SIP Registrar and SIP Proxy for Windows. Think of it as being a PBX for pure IP networks. As a software development firm, we are open to integrating our ISP Radius billing software system with any other Radius server. Please get in touch with us to initiate a first contact and discuss your needs.